Over ten years ago we lived in Kingsport TN, and were frequent visitors to the Natural Tunnel State Park just a short trip north in Virginia. Here, the CSX Railroad has a remarkable single-track line that follows the course of a small stream through a nature-cut tunnel (that's been widened over the decades to accommodate wider and taller rail traffic). 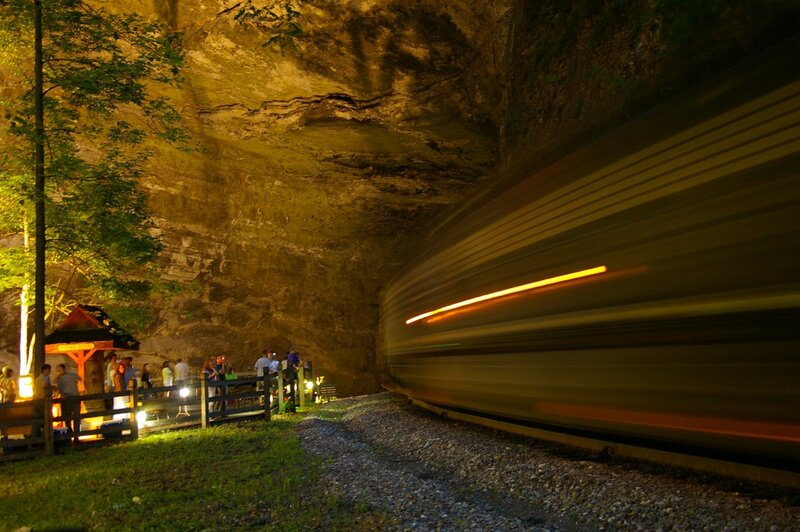 This photo was taken on a "light up night", where the park trains (pun intended) floodlights on the rock cliffs. I failed to bring a tripod, so when a heavy coal drag exited the tunnel, I pulled the DA back to 16mm at f4, held my breath, and shot (I believe) a one second exposure. This was the most interesting of all the images captured that summer evening. Still have that 16-45 but it now spends time on a K3 body. True interpretation of machines in motion.